Put the performance to one side for a moment, and the original BMW i8 is a modern design classic. Even now, it’s one of the best-looking cars on the road, so the new 2018 BMW i8 Roadster has a lot to live up to. When we drove the new open-topped i8 earlier this year, project leader Rainer Rump told CAR the original car had more bark than bite; well, after driving the facelifted i8, we're confident its replacement is an altogether different beast. Alongside the obvious cosmetic changes, the new i8 Roadster features tweaked suspension and weightier steering – and both should sharpen up the BMW’s handling. At the same time, upgraded battery tech aims to make the i8 Roadster more useful – and fun – when in EV-only mode. The new i8 Coupe benefits from all the same engineering changes as its roofless sibling. So, is the new i8 Roadster the hybrid supercar it should’ve been all along? CAR drove it in Mallorca to find out. Read on for our full BMW i8 Roadster review. What’s new in the 2018 i8 Roadster? 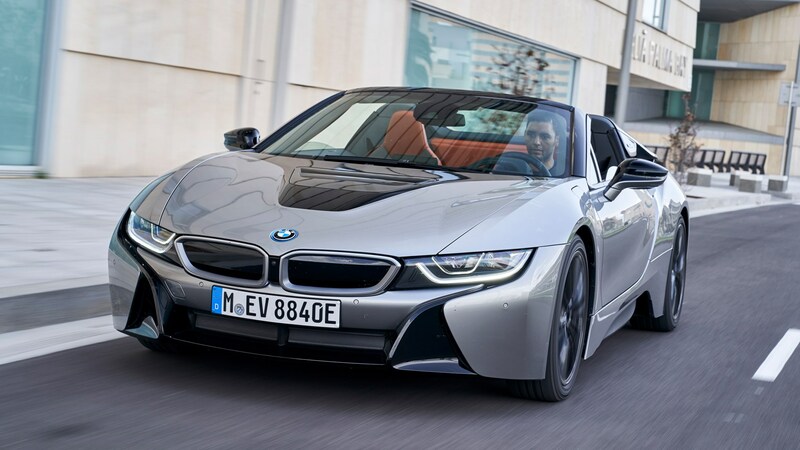 The main change to the Roadster is the removal of the car’s roof, but the i8’s striking design doesn’t suffer for it. The roof gubbins don’t detract from the hybrid supercar’s lines, and instead improve them. You’ll still find the same, shark-like snout on this i8, the same kidney grilles and swooping rear bodywork, but the addition of two flowing nacelles behind the cockpit make the i8 Roadster look as if it’s moving even when stood still. Of course, unlike an R8, NSX or even Carrera GT, there’s no meaty engine to display behind the cabin. Welcome to our electrified future. And yes, the butterfly doors return, too. Great for supercar drama, less so for finding a suitable parking space. Like the previous car, the Roadster still benefits from a stiff carbonfibre shell, but BMW has also reworked the steering and suspension of the i8 Roadster – and new Coupe, also refreshed for 2018. The way the Roadster vents excess heat from the front motor is also different. Without a roof, heat from the original car’s bonnet vent found its way into the cabin, so the new Roadster vents it under the car. The underbody is more aerodynamic to aid the new airflow, and because it’s marginally more efficient, you’ll find the same solution on the new Coupe. Inside, the changes aren’t as obvious, but the i8 Roadster benefits from a new infotainment system, so you can use the display as a touchscreen. iDrive is still here too, but now features handwriting recognition, so you can doodle addresses into the sat-nav, for example. 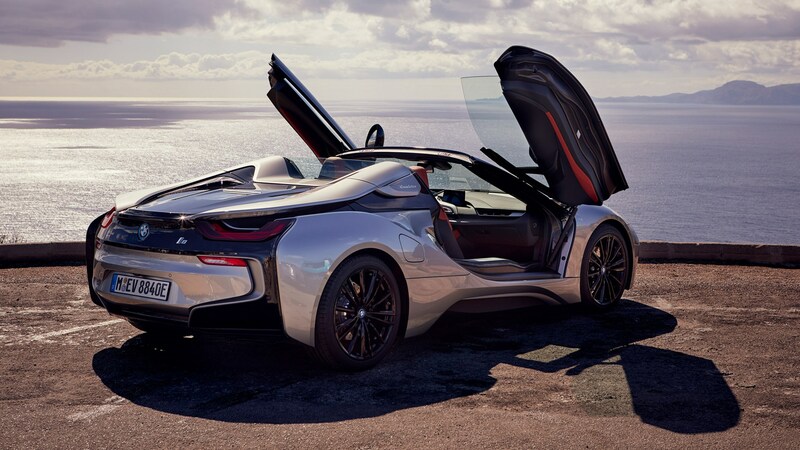 What's the i8 Roadster like to drive? If you’re hoping the new i8 has been transformed into a precise, Porsche 911-esque supercar, you’re going to be disappointed. However, the driving experience is significantly better this time around. The old Coupe’s slightly vague, fast steering has been replaced by a wheel that gives far more feedback than before, and BMW has changed the way the resistance comes in off-centre, too. 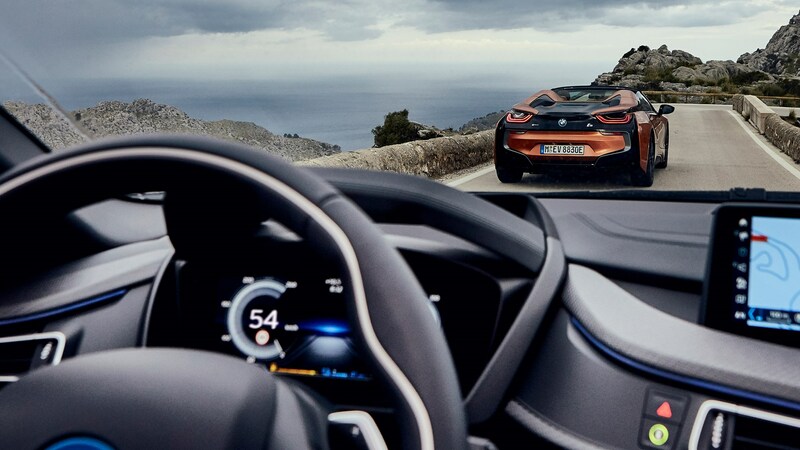 It’s present in all modes, but most noticeable when you select the i8 Roadster Sport mode. It’s not Civic Type R heavy, but it finally suits the performance offered by the rest of the car. The overall result increases your feeling of connection to the car, and helps you explore limits of that rigid carbonfibre shell and uprated suspension. The brakes are more intuitive, and the change from energy regeneration to physical braking is seamless – unlike a Golf GTE, for example. Sport mode adds a rev-counter to the car’s HUD, and while it’s a small change, it's indictive of the i8's sportier personality. The new i8 Roadster also benefits from an augmented engine note: BMW says the hybrid supercar EQ’d version of the its actual engine note, and as well as pumping sound through the cabin, a loudspeaker on the left underside of the car gives the public an earful, too. But what about the power? Rump told us the i8 chassis is already at its limit when it comes to engine size, so there’s no difference between the 1.5-litre three-cylinder in the new i8 and the last. It also means if BMW does make a more powerful hybrid supercar in future, it won't be based on the platform you see here. But there is a handsome power increase on the electric side. A more power-dense battery means electrical power has risen to 141bhp, so combined power is now 369bhp. The i8 Roadster will hit 62mph in a supercar-comparable 4.6 seconds. It's no slouch. And what about the EV-only mode? The new i8 can run on EV power alone, but the new, bigger battery means it’ll go for longer, and at higher speeds, too. EV mode is now a viable choice out of the city limits, and isn’t a tacked-on afterthought. Instead, it’s another, fully developed side to the car’s personality. Although it's not quick as using both petrol and electric power, it does offer a totally different type of driving – and at decent speeds. If you’d still prefer to use the EV-only mode – perhaps around town – you’re going to be able to spend more time doing it; range is up to 33 miles (on the WLTP test cycle). In many ways the i8 Roadster is the car BMW should've made in the first place. It still looks great, but under the surface small changes make it a tighter, more intuitive and more rewarding car to push than its predecessor. It's still not as agile as a 911 or Audi R8 RWS, but neither of those let you eat miles of motorway in comfort like you can in the BMW. Is it still divisive and impossible to pigeonhole? Almost certainly, but now that's a strength – not a weakness.